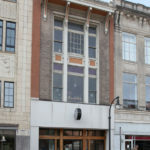 Wonderfully renovated loft-style mixed-use building for sale directly in the center of booming Downtown Durham. An excellent opportunity for live/work + income. Originally built in 1919, this 7,600 square foot building was gut renovated in 2002 and many updates have been completed since then. Configured with a retail tenant on the ground level and two full-floor lofts on the second and third floors. The retail tenant has 2 years remaining on their lease with options beyond that. The second floor is currently vacant and is an ideal opportunity for a new owner to live or operate their office. The third floor is leased to a residential tenant with a month-to-month lease. A+ location in Downtown Durham, directly across the street from the One City Center Tower project and mere steps to all of Downtown’s amenities…restaurants, nightlife, DPAC, Durham Bulls Ballpark, Carolina Theater, hotels, Duke University, etc.